Jungle animals learn that Christmas isn't about snow, Santa Claus, or getting presents, but about love. God loved us so much that he sent his son to die for us and save us for our sins. Free - Elijah and the Ravens - This skit uses a raven puppet that squawks and the following items, a clock or watch, picture of Elijah, crown, spray bottle, statue (idol), food, and the Bible verse written on a piece of paper. Polly the Raven is related to one of the ravens that fed Elijah. Polly tell about what happens using items relating to the story and the teacher interprets what he is trying to say. The puppet make squawks but does not say anything. Cast: Two dogs (Wrinkles and Sparky) and a person. This is another Wrinkles and Sparky puppet skit, with a serious theme, meant to go with a lesson about Jesus, Mary, Martha, and Lazarus from Luke 10:38-42 and John 11:1-44. 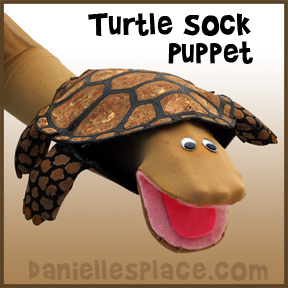 Make Squirmy the Worm puppet from socks. 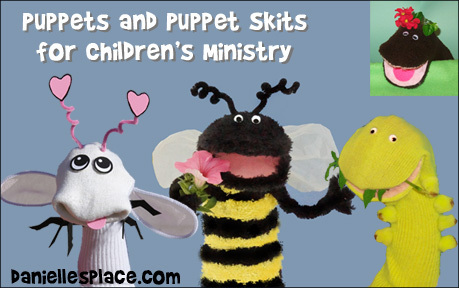 Squirmy the Worm Puppet and your students learn about God's love. God is compared to a gardener who has great plans for his children. 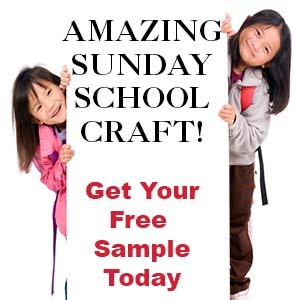 They learn that God planned to make them before they were even born, he knew exactly what he wanted them to look like, and he loves them and wants them to be happy, and healthy, and grow up to be wonderful people just like Jesus. Squirmy Worm brings back his potted plant, but he is sad because the plant didn't grow. He learns that we can be happy in all situations even when things don't go our way because we can trust God to work out his plan for us. Children also learn that Paul and Silas rejoiced even in bad times. Squirmy the Worm learns that we don't have to worry. We can be at peace knowing that God cares about us. Squirmy the Worm learns about gentleness. Children learn about Paul. Squirmy the Worm has goodness and kindness growing in his heart. Children learn about Tabitha. Squirmy the Worm learns the importance of faithfulness. Children learn about Daniel's faith from Daniel 6 . Squirmy the Worm learns why we need self-control. Children learn about the Pharisee and the Publican. Timothy Turtle learns that God protects us and is with us where ever we go. 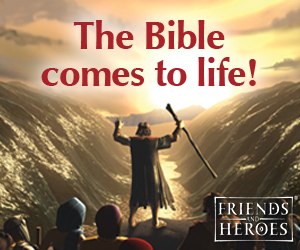 Children learn about the story of Baby Moses from Exodus 1-3. 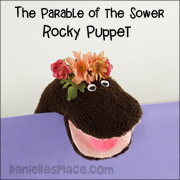 Matthew 13:1-8, 18-23, Rocky the Puppet teaches children about Listening to God's Words. A Psalm 23:1 Skit - Free Sample Lesson - Woolie tells about how the Good Shepherd loves us and gives us everything we need. A Psalm 23:2 Skit - Woolie learns that God knows what is good for us even if we don't. Sometimes it seems like God isn't listening to us or answering our prayers like we want him to, but God knows what is best for us. He knows exactly what we need and when we need it. A Psalm 23:3 Skit - Woolie gets hurt because he didn't follow the Good Shepherd. Children learn that God leads us through his word, through prayer, and the Holy Spirit. He tells us how to live so that we will be happy and successful. A Psalm 23:4 Skit - Woolie pretends to be the Good Shepherd. We don't have to be afraid because God is watching over us. He protects and comforts us when we are afraid. A Psalm 23:5 Skit - Woolie show that the Good Shepherd thinks she is special. Children learn that we are special to God. He shows us we are special by providing for our needs and giving us even more than we need. A Psalm 23:6 Skit - Woolie brings her good friends, Goodness and Mercy, to class. Children learn that when we follow the Good Shepherd goodness and mercy will follow us. 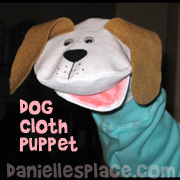 JumpNPuddles has free puppet skits and all types of puppets for sale.